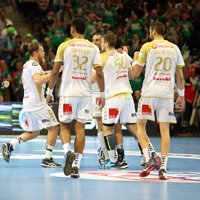 MATCH REVIEW: Saint-Raphael Var Handball avenged their defeat against Füchse Berlin in the semi-final of the Men’s EHF Cup last season as the French side opened the group phase by winning in Germany. Saint-Raphael Var Handball got substantial revenge for their 35:24 defeat against Füchse Berlin in the semi-final of the Men’s EHF Cup last season as they beat their German rivals on their own court, 26:21. As the group phase of the current Men’s EHF Cup opened Wednesday night, Saint-Raphael took a clear away win against Füchse. Saint-Raphael opened the Men’s EHF Cup Group Phase by taking a solid revenge for the 35:24 defeat against Füchse in the semi-final of the same competition last season. The French side took a clear lead from the start against the current number two side in the German Bundesliga and there was really never any doubt about the away win in the MBS Arena, Potsdam. Saint-Raphael had success with several variations of their 5-1 defence, and behind that successful defence, Mihai Popescu did brilliantly in goal. EHF EURO 2018 men’s champion - Spanish playmaker Daniel Sarmiento - was a great leader of the French attack as his Saint-Raphael side led by six goals several times in the first half. In the second half, the visitors extended their lead to 10 goals several times. Füchse managed to reduce the gap slightly but nothing created any real doubt about the result.